Our Vision is for Peach Recruitment to be the first name Clients & Candidates think of; their principal, principled recruitment agency who do the right thing every time. We Listen, Understand & Deliver. Thank you for visiting our website. Here you will find an overview of our services, our methods of operation and our commitment to offering all our clients a quality service. Please let us know if you have any specific requirements or need more detailed information on any of our services. Peach was set up in 1993 and since then has grown substantially, doing business at some time or another with most of the employers in the Shannon region as well as several others in the Mid-West. Permanent Recruitment is the core business but Peach also provide Temporary & Contract staff for short, medium and long term assignments. We pride ourselves on our internal code of conduct. We are not sales people. Our Consultants do not operate on a commission basis, therefore our motivation is making the right match between our Client and Candidates’ needs. Our recruitment consultants understand business and industry pressures, and we are well placed to respond quickly to client needs. We value our candidates as much as our Clients. We offer our candidates both employment opportunities and career advice. Our partnership approach is designed to deliver innovative and tailor-made solutions directly to clients, within timeframe and budget. We know from experience that for an assignment to be successful, we must have an understanding of our Clients corporate culture, its business and its competitive environment. To us, a shortlist of candidates means just that. We will only refer candidates we believe match or exceed client expectations, and each candidate is met and screened by us in advance of any contact with our clients. We earn our fee by putting in the time to get it right first time. In addition we offer a 100% refund of all placement fees, within the first 3 months, if our placed candidate does not work out due to unforeseen circumstances. We will do everything we can to match the right people to the right roles. We have a commitment to place people in organisations in which they will thrive and add value. Our Mission is to be the best we can possibly be. We place people first. We are proud of what we do and how professionally we do it. We treat our clients and candidates with equal respect. Recruitment and placement specialists. Providing for permanent, temporary, or contract staff. Executive search and selection. Register a vacancy. Recruitment and placement specialists. Job-seeker Registration. Interview and CV tips. At our offices in Peach House in Shannon we provide a friendly and warm atmosphere to consult with job-seekers and employers. Derek Barrett is the founder and Managing Director of Peach Recruitment which was established in 1993. In developing the business model for Peach he set out to do things differently, operating to a key principal – To Do The Right Thing, Every Time. This has been pivotal in developing our reputation and being one of the most respected agency’s in the region, by Clients and Jobseekers alike. Caroline has almost 20 years’ of HR experience from a wide variety of industries, including Aviation, Legal, Manufacturing, Supply Chain, Customer Services and most recently Financial Services. Having operated as a HR Manager for many years Caroline has a great understanding of the needs of a business when trying to source the right people for the right roles. At Peach we are committed to providing the highest possible standard of services to our Clients, she focuses on Business Development, Operations and Recruitment and is available to help all existing and new clients and candidates with any recruitment needs. Caroline has a Bachelor of the Arts and is a Chartered CIPD Member. Fiona has been working for Peach for 17 years to date and has extensive experience of recruitment across many sectors including Manufacturing, Sales, Customer Service, Accounting, Legal, Aviation and more! She is involved in Recruitment at all levels; entry level to senior management roles for both contract and permanent staff. Fiona has a Bachelor of Science from the University of Limerick. Fiona has proven experience of building strong working relationships with our Clients and Candidates. 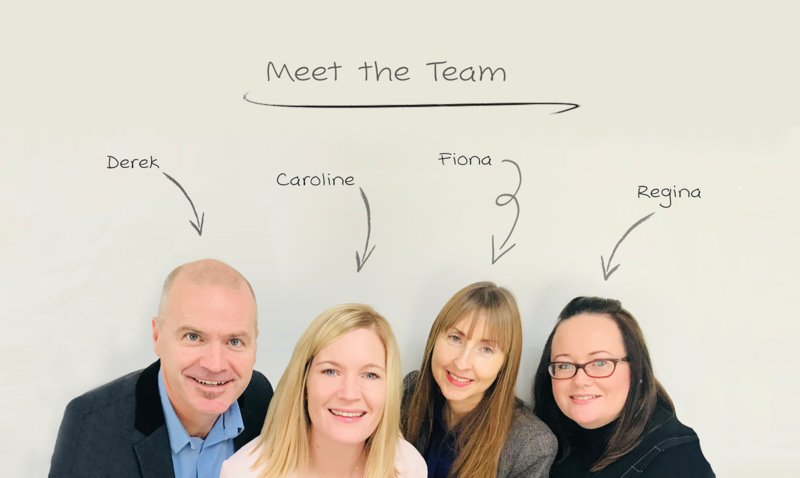 At Peach we always try to ensure that our candidates and clients complement one another and Fiona strives to achieve this goal at all times, helping to place the right candidates into the right roles. Regina has been happily working for Peach for over 15 years so far! She has over 20 years’ experience in Recruitment, Payroll and Administration in the Aviation and Service sectors, in both back office and Customer facing roles. Regina has a hugely varied role at Peach House, with responsibility for Payroll Administration, Accounts, General Administration & Recruitment as well as a little bit of everything else! Regina has a Diploma in Payroll. Regina epitomises our ethos of providing the highest possible standard of service to our clients and candidates and is frequently complimented on her warm and professional style.